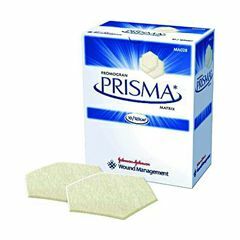 Gel- Care Gel Sheet - 4" x 4"
PROMOGRAN Wound Dressing - 4 1/3 x 4 1/3"
Promogran Prisma Matrix Wound Dressing is designed to provide protection and growth by addressing the continuous changes in the wound micro-environment. The unique combination of 55% collagen, 44% ORC and 1% silver-ORC absorbs destructive components of chronic wound fluid and creates the optimal environment for cellular growth. Promotes Healing. Easy To Use. Safe. Emergency Preparedness. Keep In The Medicine Cabinet. Effective. Promotes Healing. Easy To Use. Safe. Having just heard of the product, and having a new wound on my ankle,Promogran has been very successful in promoting new skin buds on a very difficult area. I suffer with scleraderma and have been treating wounds on feet and lower legs for past three years. Anything that would speed up the healing process is a God send. Promotes Healing. Safe. Easy To Use. Effective. Acute wounds. Hard to heal wounds. I had a breast augmentation and lift in March. Developed a superficial tear in my incision, which than spread. It was left untreated by a plastic surgeon so long that it was almost impossible to close. I was about to loose my breast because wound was starting to erode other areas. A wound center started treating with Prisma Matrix, within the first week it started to close, new skin was forming. Its been almost 4 weeks and the improvement that is shown to my wound do to the Prisma are remarkable. It saved me. I suffered for months, and now its finally starting to heal. Safe. Easy To Use. Promotes Healing. Effective. I use this on an open foot ulcer. First clean the wound. Then apply Regranex, enough to cover area of desired skin growth. Add a small piece of Prisma. Bandage wound with plenty of gauze for protection. My husbands sore is on his big toe and we started using Prisma over a week ago; will it cause the place to callus over and look bigger. Toe not red or anything just don't know what to look for and can't get up with Dr. until next week. Asked on Sep 28, 2012 9:39:04 AM by Bernardo Saldana from Hartford, Ct.
How thick & soft is this product? My son has a pressure sore on back of head from wheelchair headrest. Anything very thick only causes more pain & pressure because it pushes on bony protuberences of skull. My wound care Dr told me to treat my wound with Bacitracin, THEN top it with the Prisma. Seems to be working well! If you read the full description on Allegro website, it explains the medication in the Prisma. I have just started using Prisma (from wound care physician) for a probable venous stasis ulcer on my ankle. This has been very slow to heal, and since yesterday have been using Prisma. Overnight the Prisma seems to have disappeared from under a gauze wrap bandage....When I last looked it was a solid white material....did it dissolve(does it do this?) or did it get knocked off the wound somehow? I was told to change it every other day...but I do clean the wound twice daily. Can anyone advise me? I have never had such a wound before and completely in the dark about treatment and the time required to heal this wound. It has been so depressing! It is suppose to melt per say, but don't clean it again until time to clean and add more prisma. It is still sorking even though you do not see it. Leave the bandage sealed for the 2 days and then clean and add more prisma. You are actually wiping off the medicine, cleaning prior to time and not adding meds. It is a 2 day med. I wanted to take the time to commend AllegroMedical on its exemplary service. I only ordered a small inexpensive device, and got all the notification e-mails on time. I even received it early. Not only was the price very reasonable, but for once, the shipping and handling was actually for shipping! It did not have profit added in. ($.50 on a $15.00 item) It may not mean a lot to some, but since I've become ill, I do all my shopping over the internet. When was the last time you were charged $.50 for shipping and received the item within a week? I can't count how many times the "shipping" has been more than half the cost of the item ordered. It is refreshing to see a company honest in the smallest detail where we've become so complacent to being cheated by almost everyone. (Specially the "deals" "as seen on tv") AllegroMedical has certainly gained my business and more importantly gained my trust and respect.